At last week’s 2018 Hampton Rovers Presentation Night, Tim Wilson and Miranda Marron became the newest recipients of Life Membership. The awards were presented in front of over 190 people at The Brighton International, making it the largest post-season event for the club. Both Tim and Miranda are worthy recipients of Life Membership, having spent many years involved at the club, beyond the minimum as set out in the guidelines for this prestigious award. Tim grew up at the Rovers, with his Dad Ron heavily involved as player, coach and life member himself. Tim first pulled on the boots for the club in 1989 but was forced elsewhere due to the club not fielding teams in his age group. He returned as a player in 1998 but his playing days were cut short by injuries, work and family commitments, however he was there supporting week in week out. Tim’s Dad and his legacy at the club has always meant a lot to Tim and he wanted to put back and get involved as it played such a big role in both his, Ron’s and their extended family’s lives. Tim stepped up in 2008 as Senior President in which the club had recently been through some difficult times. He was able to really deliver over that period in the role, and by the time he stepped down from the position a few years later, he had rebuilt a great culture, the seniors were in a much better position both on and off the field, up in Premier B section, and set up for success going forward. As well as Senior President, other roles Tim has fulfilled over approximately 14 years at the club include Seniors & Reserves Assistant Coach, Recruitment Manager, Chairman of Selectors, Senior Team Manager, Runner & Waterboy, and General Committee. Tim has continued to help out this year as Assistant Coach of the Reserves who made it through to the Grand Final. Tim’s support of the club continues well beyond his official roles and he’s certainly a familiar face at the Boss. Miranda, her husband Steve and her two boys Tom and Ben have been Rovers through and through, with Tom playing U19 and coaching U17s this year and Ben playing in the 17s team to win the flag this year. This great football family is driven by our beloved Miranda Marron. Miranda started at the Rovers in a role of team manager 10 years ago with the U9’s. She has been an incredible asset to team management at the juniors do the role every year from that point until this year at U17s Team Manager. As you can image the Team Manager role for in the juniors is very much like herding cats and Miranda is simply a brilliant asset in this regard. Miranda has already volunteered to continue this role with the U19s in 2019 which is fantastic. 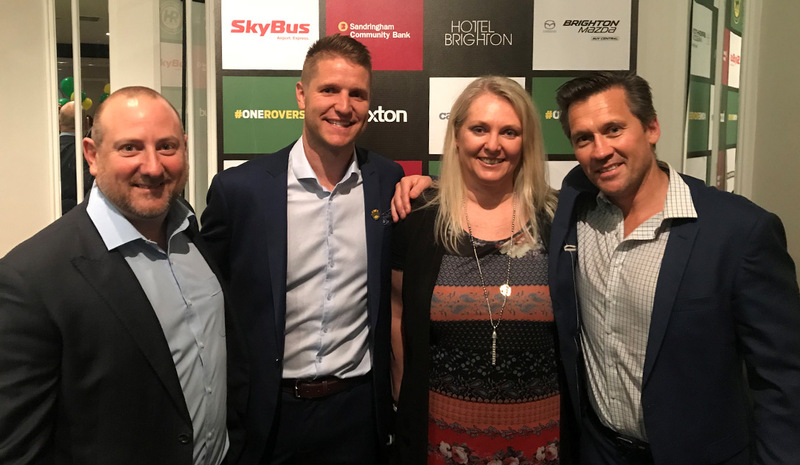 Along with TM duties week in week out, Miranda often volunteers and helps during club functions and issue resolution such as player registrations and general incidents. One important role more recently is driving the success of the merged teams with East Sandringham. Miranda has been open and welcoming and driven the teams to feel one unit which has been an amazing success. In fact, this culture of inclusion has certainly been a part of the U17s winning the premiership this year. We often talk about the key mantra for us in Juniors: Passion, Teamwork, Fun & Respect. Miranda not only lives these but instils this in “her boys” and we will be forever grateful for the role she has played in shaping our Rovers boys into great men. Both Miranda and Tim bleed green and gold and both are more than worthy of life membership in a club both recipients love. Congratulations!